Even though the Water Is Life Rally was held in the Bible Belt, Rev. Wilson was the only speaker who cited scripture and invoked Jesus Christ. Drums and tambourines reverberated in unison to chants of “No justice, no peace! No pipelines on our streets!”, and the event’s other speakers railed against the greed of Big Oil companies and US imperialism. 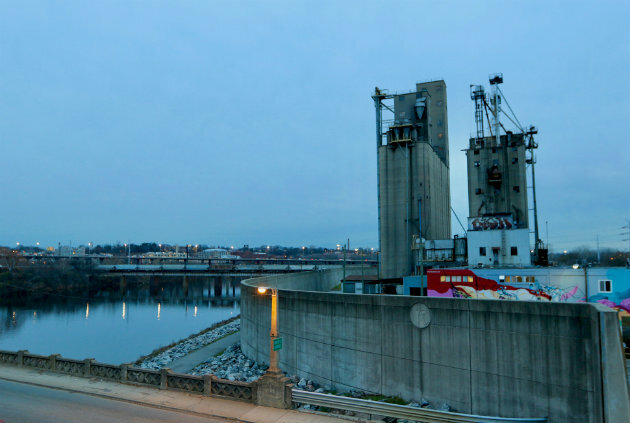 In Richmond, industrial factories and interstate highways are often adjacent to African-American communities, causing air pollution and contributing to higher instances of asthma among blacks. Fueling US Forward, until recently, was one of those campaigns. When HuffPost first reported on its existence in early 2016, the group had an annual budget of roughly $10 million and was run by Charles Drevna, a former petroleum industry lobbyist, and James Mahoney, a board member and former executive for Koch Industries. Later that summer, Drevna spoke at the Red State Gathering in Denver, telling the right-wing activist conference—in a speech where he referred to EPA employees as “clowns”—that the fossil fuel industry was losing ground because it was failing to connect with the public, especially minority communities, on a cultural, emotional, and personal level. At the Richmond gospel concert, Fueling US Forward sought to link energy production to the everyday issues that it said stymie economic mobility for African Americans—such as prices at the gas pump, heating, and electric bills. That message was delivered in part through discussions featuring prominent African-American business leaders. One of the participants was Derrick Hollie, a career marketing consultant who is also the founder of Reaching America, a nonprofit that describes itself as “focused on innovative solutions for African Americans not based on right or left wing views but what makes sense for a more united America.” Reaching America cosponsored the Fueling US Forward gospel concert along with Radio One, an entertainment network targeting African Americans now known as Urban One. The corporation once employed Hollie as a national sales manager. Despite Reaching America’s nonpartisan claims, Hollie has been associated with the black conservative network Project 21 and identified as a right-winger on TV news shows. And much of Hollie’s environmental advocacy has been in line with the Koch brothers’ priorities. His arguments focus on what he calls “energy poverty”—when low-income households spend large portions of their disposable income to keep the lights on and fill up their gas tanks. He’s invoked the phrase while speaking in support of fracking in Maryland, Rick Perry’s appointment to lead the Department of Energy, and most recently, the Trump administration’s planned withdrawal from the Paris accord. Hollie did not respond to requests for an interview. While Hollie has remained visible since the Richmond event—launching a Reaching America podcast series and palling around with Perry and other Cabinet secretaries—Fueling US Forward has gone dark. Calls and emails to Fueling US Forward and its president Charles Drevna to comment for this story were not returned. But Fueling US Forward’s message lives on. Scott Pruitt, head of the Environmental Protection Agency, employs talking points that echo those Drevna used while promoting the organization in conservative circles, complaining that the EPA’s regulations pick “winners and losers” in the energy space. Rev. Faith Harris remembers first hearing ads about the Fueling US Forward gospel concert on urban radio stations back in 2016. A minister, teacher, and environmental activist at Virginia Union University, a Richmond-based historically black college, Harris was among many African Americans in the region angered by what she calls a “purposeful misinformation” campaign. She says it was surreal to hear a D.J. invite listeners to “learn the truth” about whether the country is using enough fossil fuels. 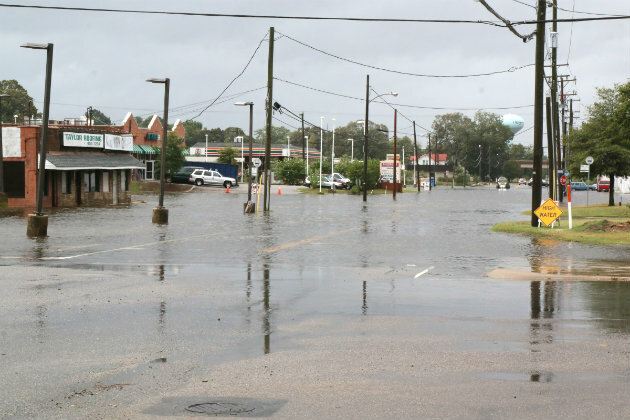 Coastal flooding is a frequent occurrence in the Hampton Roads section of Virginia. Richmond remains one of the deadliest places in the US for people suffering from asthma, according to the Asthma and Allergy Foundation of America, a consequence of a high poverty rate and a large proportion of uninsured. The chronic respiratory condition is linked to living near industrial factories, as well as urban planning that drove interstate highways—and their accompanying diesel pollution—through many black neighborhoods. While gospel provided the soundtrack to the Fueling US Forward event in Richmond, it was bluegrass and folk that pumped through the loudspeakers at December’s Water Is Life Rally. Rev. Wilson was one of a dozen or so African Americans taking part in the event. 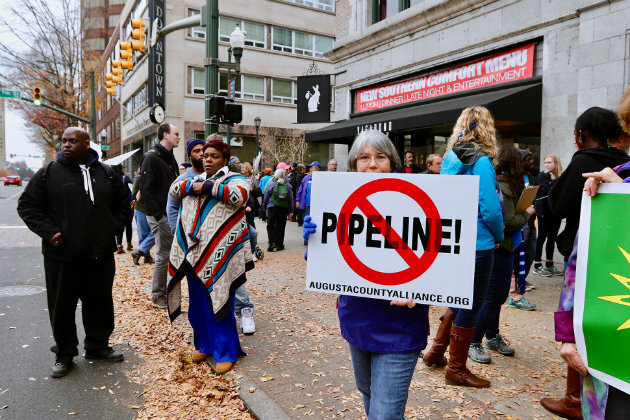 Most of those assembled to protest the Atlantic Coast Pipeline were white millennials and baby boomers who donned anti-establishment paraphernalia and waved “No Pipeline” signs to the honking cars that passed by. Members of Virginia Civic Engagement Table (left) protested as part of the Water is Life Rally. 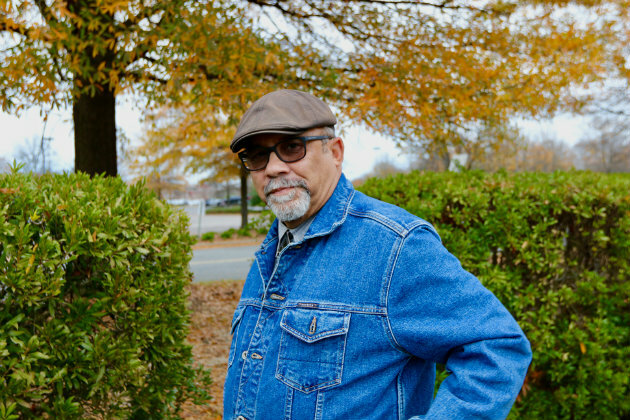 Virginia’s black community is also becoming more active in pressing elected officials on the environment and climate change. Two months after the gospel concert, clergy members joined the Virginia Conservation Network—a coalition of organizations and community members that advocates for clean energy and environmental justice—for a panel discussion on how to inoculate themselves from Fueling US Forward–type messaging. Freshman Democratic Congressman A. Donald McEachin, who’d recently been elected to represent Virginia’s 4th District—which runs from the southwestern suburbs of Richmond to the southeast corner of the state—joined the discussion. He has since joined with two other freshman representatives to form the United for Climate and Environmental Justice Congressional Task Force. Rev. Paul Wilson is educating both his congregations and surrounding community about attempts by fossil fuel proponents, like the Koch brothers, to exploit people’s misunderstanding of climate change.